The internet has given us a great, great many gifts. 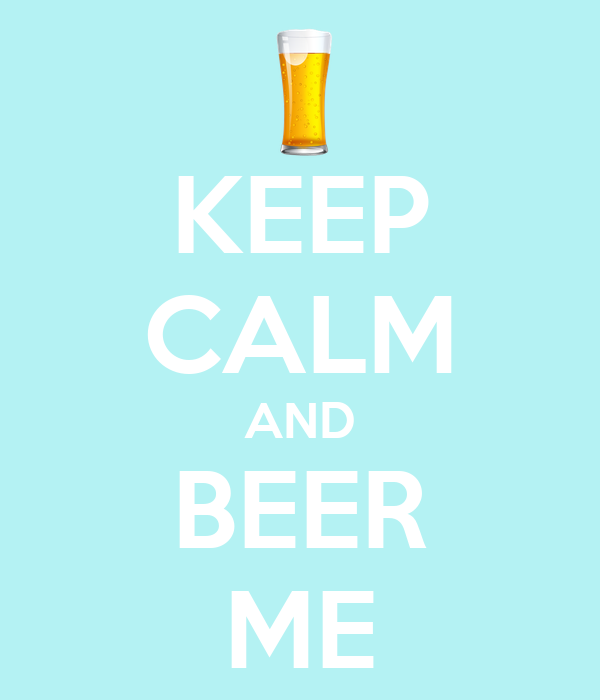 Keep Calm And [Do Everything!]. Keeping calm, I’m not so good at. It requires a lot of effort, much more than over-reacting and waving my hands around and yelling does. Plus, if I’m freaking out, I’m occupied and therefore not quietly scheming a way to hide your body. We all win, here. 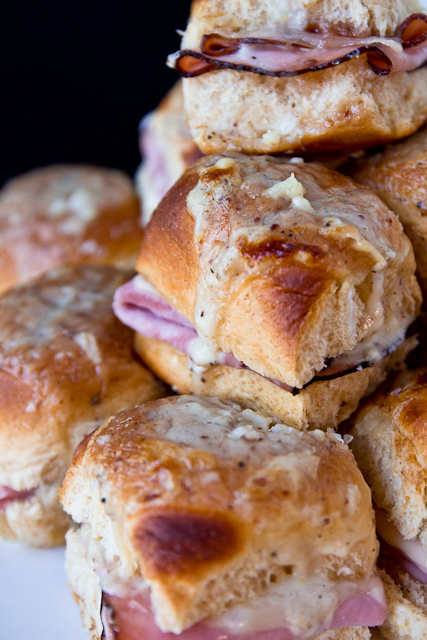 But better than all of that – and almost even better than ProFootballMock’s QBs on Facebook – are those baked ham & cheese sliders. You know the ones, made out of those popular sweet dinner rolls and doused with a stick of melted butter. Guys. An entire stick of butter. There are days when that’s appropriate because butter fixes feelings, just like duct tape fixes anything that isn’t feelings. Or food. But on days when a stick of butter isn’t required, or really wanted (it sometimes happens), we add a spoonful of strawberry jam to those sliders before drowning those little miniature bites of internet wonderful in a garlicky cheese sauce. And just like that, those little “Green Eggs & Ham” Sliders from your kid’s Cat in the Hat birthday party are suddenly uber-fancy miniature Croque Monsieurs. 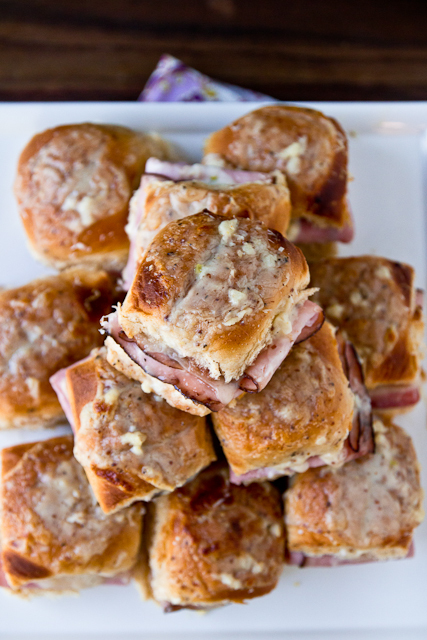 A garlicky cheese sauce converts the popular baked ham & cheese slider into a miniature croque monsieur. Preheat the oven to 375 and line a baking dish with foil. In a small sauce pan over medium heat, melt the butter, add the garlic and stir, letting it cook for ~1 minute. Stir in the flour and black pepper until smooth, let cook an additional 1-2 minutes, stirring occasionally. Add the mustard and slowly stream in half of the milk, whisking to keep the sauce smooth. Add the cheese in two parts, whisking until smooth after additions. Finish with the rest of the milk and let cook for another 2-3 minutes until bubbly around the edges and thick enough to generously coat the spoon (you're going to spoon this over the sandwiches and want it to be thick enough to mostly stay in place). Slice the rolls in half horizontally (if you break the rolls into 2 halves of 6, you can do this with 2 cuts and not squish the bread). 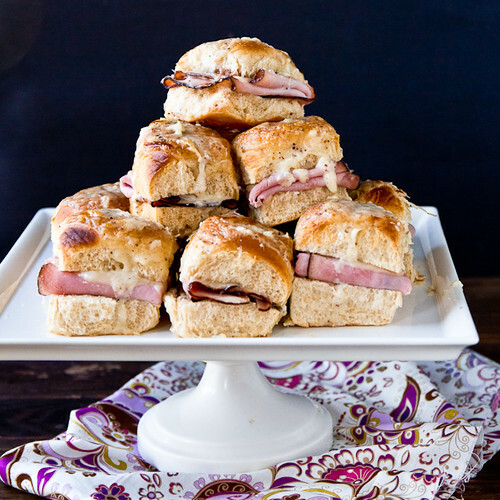 To build the sliders, spread 1 tsp of strawberry jam on the bottom roll, top with a slice of ham (folded to fit), a quartered piece of cheese, a spoonful of the sauce, and the top roll. After all rolls are assembled, spoon all of the sauce over top. If you find the sauce too thin, reheat it for a couple of minutes over medium heat. Sprinkle grated parmesan over top and bake for ~15 minutes, until the cheese begins to brown. Serve hot. Or warm. Or straight out of the fridge the next morning for breakfast. Seriously, they're that good. And most importantly, thank the internet for being so fabulous. Source: A smash-up of this and this. I freaking love this. 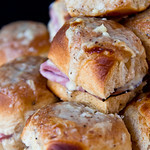 Croque monsieurs are one of my favorite sandwiches and you just made them easy, mini, and great for parties. So pumped. Yes. I have a love/hate with the Interwebs. Buuuuuuutttt not with these sliders! Brilliant!!! that’s a good idea ! it seems delicious. unfortunately i can’t it them because of the gluten but Mr Pomme would love ! The internet definitely has the good and the bad! But…I’m pretty sure these fall safely on the REALLY good side. The internet barfed sprinkles and pumpkin spice everywhere, too. I made the original version of these lil’ sammiches for my meat, cheese, potatoes, butter loving husband, and his first comment was that there was too much butter. I had to pick my jaw up off the floor. These remind me of Monte Cristo sandwiches, and I cannot wait to try them. You win the internets. Yummm! These would be delicious with a “Thanksgiving” spin– you could make them with turkey and apple butter/apple compote instead. Thanks for sharing such a great recipe! Ooooh – or cranberry sauce! Great idea!